Diamond Select Toys is gearing up for their next convention, and in one month they’ll be at New York Comic-Con in Art Asylum’s hometown of New York City – the birthplace of Minimates! Not only will DST have a cool new exclusive product — as well as the ever-popular Build-A-Minimate station — at booth #2036 at the Javits Center, they’ll be hosting two panels full of hot new reveals! Read on for more info! First things first: the exclusive! 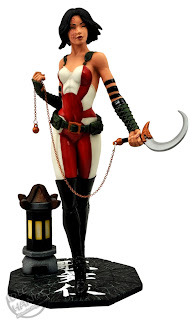 DST will be offering an extremely limited variant on their 9-inch Femme Fatales PVC statue of David Mack’s Kabuki. Only 100 pieces have been made of an unmasked Kabuki, showing off her facial scars. The individually numbered statues will be sold in a window box for $45, and will go on sale on Thursday, Oct. 10, at the start of the show. So if you don’t have a four-day ticket, ask somebody who does to swing by! And now the panels! On Saturday, October 12, at 12:15 pm in room 1A01, DST will host the first of two panels, titled “Diamond Select Toys: The Best of All Worlds.” This panel will attempt to cover all of DST’s non-Minimates product lines, from Select-scale 7-inch action figures to electronic vehicles to busts to role-play items to vinyl banks. Diamond Select Toys Director Chuck Terceira, Product Manager Robert Yee and Marketing Supervisor Zach Oat will talk Marvel, Batman, The Walking Dead, Star Wars, Star Trek, Universal Monsters, Godzilla, Pulp Fiction, Clerks, Lost in Space, Aliens, Sin City and more! Special guests will include sculptors Jean St. Jean and Eli Livingston, as well as TV’s Batman! They’ll also hold a Q&A, announce some brand-new products, and there will be a prize drawing at the end of the panel! And on Sunday, Oct. 13 at 1:30 pm, in room 1A08, DST will host their second panel, “Marvel Minimates: A Toy Line Turns Ten.” Wrapping up the tenth anniversary celebration of the Marvel Minimates line, Chuck, Robert and Zach will talk about Thor: The Dark World, Captain America: Winter Soldier and their plans for the next decade! Plus, they’ll also share info about the other DST Minimates lines, including The Walking Dead, Sin City, Aliens and Battle Beasts, as well as submit to a Q&A session and show off new artwork! Special guests include artist Uriel Caton and animator Alex Kropinak! Plus, there’ll be a Minimates-themed prize drawing at the end of the panel! And don’t forget that if you purchase $20 worth of Minimates in our company store, you get to build your own Minimate at the Build-A-Minimate station! Ten years of parts are just waiting for you to create your own one-of-a-kind Minimate to take home! New parts added daily! So be sure to attend one or both panels, and come by booth #2036 to see the newest prototypes and products from Diamond Select Toys and Art Asylum!